As I was leaving Montrose on Sunday I noticed some movement almost directly above me just under the canopy of a tall Honey Locust. When I looked with my bins I saw a juvenile Peregrine Falcon grasping a deceased Northern Flicker. 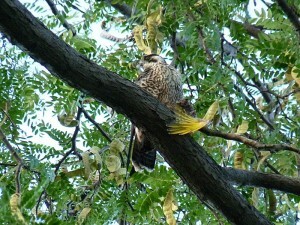 The Peregrine had captured the Flicker and was eating it in comfort under the cover of the canopy. I took a few pics and let the bird eat breakfast in peace. This entry was posted in Fall Bird Reports and tagged Hawks, Peregrine Falcon on September 30, 2013 by rhughes. The Birds of Illinois list on the Illinois Ornithological Society website has been updated to reflect taxonomic changes and recent additions and removals. The list is available for downloading as Word, RTF, Excel, and PDF documents. Go to the Birds of Illinois page on the IOS website. This entry was posted in Events on September 26, 2013 by rhughes. Montrose was fairly slow this morning, September 22, at least compared to the reports from the day before. It seems like it’s always like this. My best find was a Nelson’s Sparrow in the meadow northeast of the Magic Hedge, the first of hopefully many more to come. I also had a Yellow-billed Cuckoo, a somewhat early Golden-crowned Kinglet, and a couple American Pipits on the beach. On a side note, today’s Nelson’s Sparrow represents a birding milestone for me, the first time in 35 years at this game that I’ve seen all 7 Ammodramus sparrows in the same year. I had Baird’s Sparrow in North Dakota in May, Saltmarsh and Seaside Sparrows in Delaware in August, and LeConte’s, Henslow’s, and Grasshopper Sparrows in the Midwest in the spring. This entry was posted in Fall Bird Reports and tagged American Pipit, Cuckoos, Nelson's Sparrow, Pipits, Sparrows, Yellow-billed Cuckoo on September 22, 2013 by rhughes.